The LM 26 provides a two input/six output analog configuration that is ideally suited for multi-way loudspeaker crossover, delay and EQ functions. The LM 26 also provides 4 × 8 AES3 digital I/O and 4 × 8 Dante networked I/O, all with comprehensive signal routing to provide Dante break-in / break-out and failover functionality. Two LM 26 units may be stacked and linked to function seamlessly as a single 4 × 12 processor. LM 26 provides the ultimate combination of input/output signal flexibility and fail-safe operation. Audio inputs are accepted via the Dante network as well as on connectors for AES3 digital and analog. 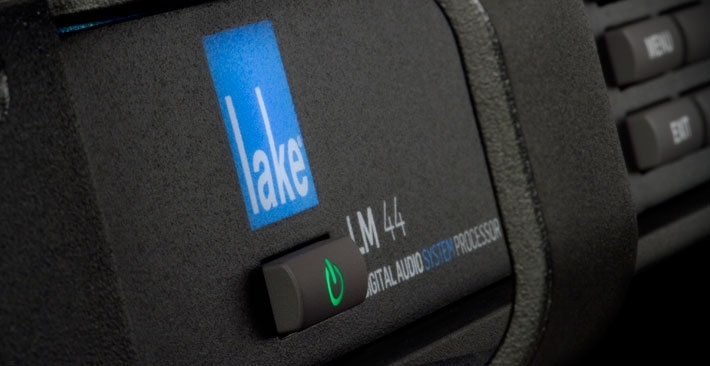 Simple programming in Lake Controller allows multiple, user-configured automatic switching scenarios. For example, signals may be distributed over the Dante network, with an AES3 input source failing over to analog – and with the result automatically cascading to all Dante receivers. In addition, the LM Series’ dual-redundant network topology enables seamless switching in case of a problem on one Ethernet link. In all situations, the LM 26 constantly monitors both the network and all active inputs to detect active audio signals, valid digital clocks, and valid network integrity. If problems are detected, automatic input priority switching ensures that the show will go on.